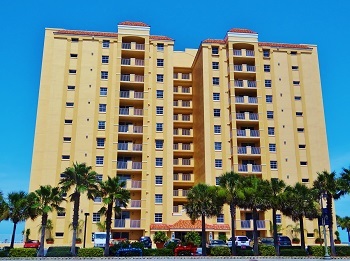 St Croix Condominium is a highly desired Mediterranean style complex located on the drive beach in Daytona Beach Shores. Enjoy the 40 foot balcony and listen to the sound of the ocean. Building amenities include clubroom, fitness room, oceanfront heated pool and hot tub, library and more! The luxury features include marble vanities, walk in closets, large showers, large windows and high end appliances. This 12 story, 59 unit complex allows 2 pets up to 60 lbs which is very hard to come by. There is a 3 month minimum rental policy in place. Floor plans available include large 3 bedrooms and 3 bathrooms with over 2300 sqft of living space.